SPRING Chakra Survival Vitality Bundle | THREE Month Seasonal Skin Food Package! Spiritual & Other Energy Work! click on the below links for SUMMER, AUTUMN, WINTER Season! 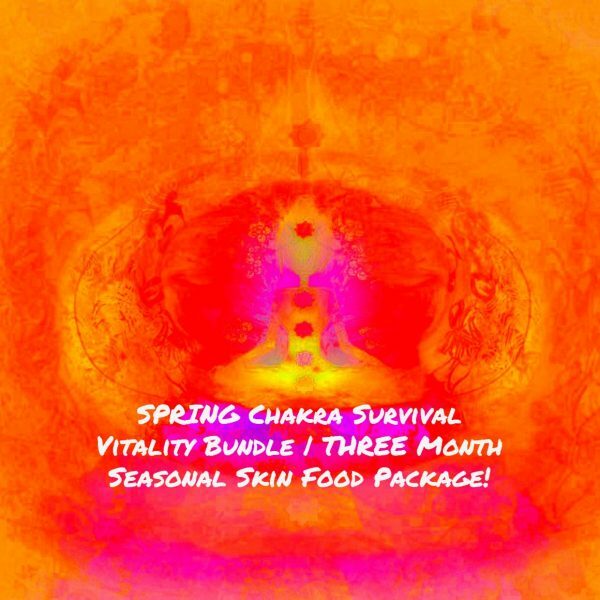 SPRING Chakra Survival Vitality Bundle our THREE Month Seasonal Skin Food Package! Choose from our FOUR Season Packages! Chakra Survival Vitality Bundles are created for seasonal use containing the highest quality foodgrade ingredients which are not only beyond organic and vegan, they are laced with the most divine, high frequency oils, sacred waters and therapeutic essential oils. These high frequencies have an amazing effect on the Chakras raising one’s energy to unconditional love, passion and divine abundance. Our SPRING Chakra Survival Vitality Bundle promotes healing, grounding and communication with the spirit world. The Root Chakra (Muladhara) is located at the base of the spine (tailbone area), the coccyx and this is where our sense of security lies. The gateway of birth and the reproductive organs. Sacral Chakra located in the lower abdomen known to be the center of pleasure, movement, enjoyment and creativity. The Root and Sacral Chakra are the energetic vortices that are the most connected to our feelings of attachment. Nourishes love and passion. 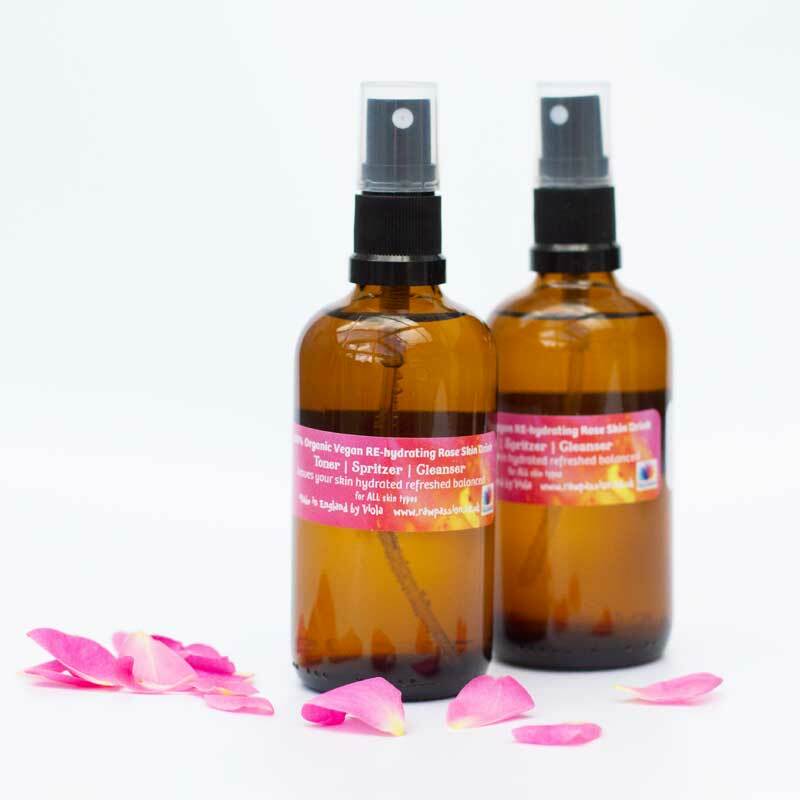 Clove, Clary Sage & Red Mandarin SPRING Survival Vitality Bundle was created for intensity as a THREE Month Seasonal Package for use on your root & sacral chakra. When the root chakra and sacral chakra becomes blocked, we experience lower-back pain, immune problems, constipation, depression and yes, even varicose veins. The sacral chakra, also known as the ‘womb chakra’, is centered in the pelvis, lower abdomen, and lower back. You are very likely to experience a lot of old memories, feelings, sensations and emotions as the healing energies are working in various chakra centers. Charged with the intent of letting go of limiting beliefs! Envision the colour ORANGE or RED when meditating! SPRING Chakra Survival Vitality Bundle | THREE Month Seasonal Skin Food Package! 100% Organic Vegan Ethical, Luxurious Food-grade Ingredients! 100% Certified Rawsome Organic Vegan Ethical Ingredients: Anthemis nobilis (Chamomile) Flower Water, Citrus reticulata (Mandarin Red) Peel Oil, Eugenia caryophyllata Clove (Bud), Salvia Sclarea Clary Sage (flowers / leaves), Naturally Occurring: Eugenol, Linalool. 100% Certified Rawsome Organic Vegan Ethical Ingredients: Soapwort (Saponaria Officinalis), Shikakai (Acacia Concinna), Oil of Coconut (Cocos Nucifera), Oil of Olive (Olea Europaea), Oil of Hemp ( Cannabis Sativa), Oil of Jojoba (Simmondsia Chinensis), Oil of Avocado (Persea Gratissima), Oil of Sesame (Sesamum Indicum), Prunus Armeniaca (Apricot) Kernel Oil, Vitamin E (d’alpha tocopherol), Anthemis nobilis (Chamomile) Flower Water, Citrus reticulata (Mandarin Red) Peel Oil, Salvia Sclarea Clary Sage (flowers / leaves), Eugenia caryophyllata Clove (Bud). beyond luxurious moisturizer and revitalizer | revitalizes and rejuvenates hair and skin | excellent skin and hair conditioning properties |to remove the oil, shampoo your hair | alternatively leave the oil in overnight as a deep conditioning treatment. Repeat once a week. 100% Certified Rawsome Organic Vegan Ethical Ingredients: Organic Cold Pressed Camellia Seed Oil (Camellia Sinensis), Eugenia caryophyllata Clove (Bud), Salvia Sclarea Clary Sage (flowers / leaves), Citrus reticulata (Mandarin Red) Peel Oil, Naturally Occurring: Eugenol, Linalool. 100% Certified Rawsome Organic Vegan Ethical Ingredients: Butyrospermum Parkii (Shea) Butter, Helianthus Annuus (Sunflower) Seed Oil, Prunus Armeniaca (Apricot) Kernel Oil, Eugenia caryophyllata Clove (Bud), Citrus reticulata (Mandarin Red) Peel Oil, Salvia Sclarea Clary Sage (flowers / leaves), Naturally Occurring: Eugenol, Linalool. Our Deodorant Cream can also be used as a pamper treatment on your feet – a little goes a long way! Each chakra contains a blueprint for our optimal physical, emotional, mental and spiritual health. Apply as required. Use any time of day. Suitable for all skin types and ages. For topical use! PLEASE NOTE: Due to the natural ingredients the colour, consistency and scent may vary from batch to batch! Only available as a bundle! Choose the Chakra Survival Vitality Bundle you feel drawn too or choose a ‘Seasonal’ one of our “Four Season Bundle” package.